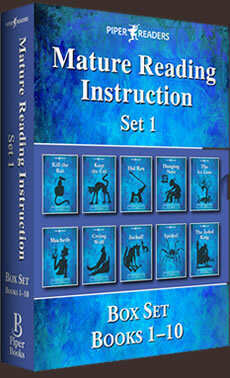 Mature Reading Instruction is available in eBook format on iBookstore and Amazon, and will be available on Google play and Kobo soon. 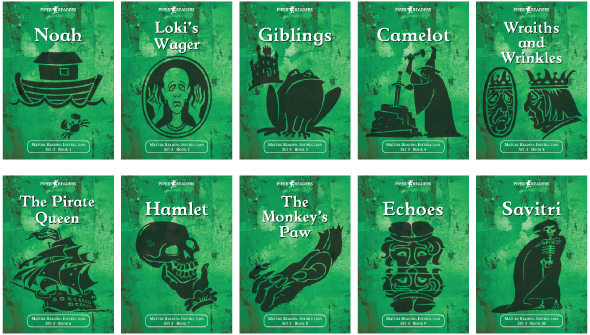 If you want to receive an alert when the eBooks become available please email your request to enquiries@piperbooks.co.uk. 10 Books, c.750 words per book. It is recommended that students start with MRI Set 1 unless their knowledge of Basic Code is insecure. 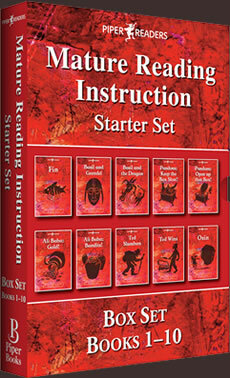 The Mature Reading Instruction Starter Set focuses on Basic Code sound-letter correspondences, with the gradual introduction of some common Advanced Code correspondences: ‘ay’ /ae/, ‘ee’ ‘e’ /ee/, ‘o’ /oo/, ‘al’ /or/, ‘o’ /oe/, ‘u’ /00/, ‘ow’ /ow/, ‘ou’ /ow/, ‘or’ /or/, ‘wh’ /w/, ‘y’ /ie/, ‘er’ /er/, ‘i’ /ie/. This set contains 90%-plus single-syllable words. 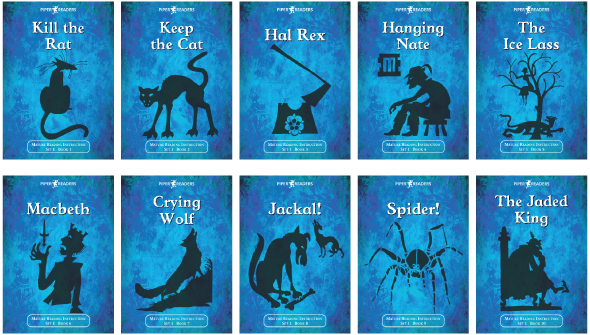 Most words are repeated several times, leading to enhanced comprehension and promotion of fluent reading. All MRI eBooks provide information on each new sound-letter correspondence as it is introduced, plus background information about each story. 10 Books, c.1800 words per book. 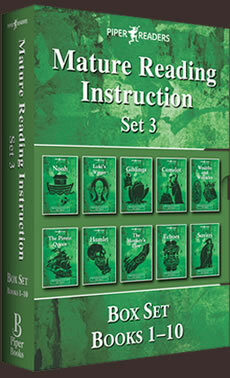 Mature Reading Instruction Set 1 focuses on Basic Code and common Advanced Code correspondences including ‘ng’ /ng/, ‘ey’ /ae/, ‘ore’ /or/, ‘ur’ /er/, ‘ir’ /er/, ‘or’ /er/, ‘o’ /00/, ‘ar’ /ar/, ‘gh’ /g/, ‘ere’ /air/, ‘o’ /u/, ‘are’ /air/, ‘air’ /air/ and split digraphs ‘a-e’, ‘i-e’, ‘o-e’, ‘u-e’. Suffixes ‘-ing’ and ‘-ed’ are introduced, together with contractions and possessives. 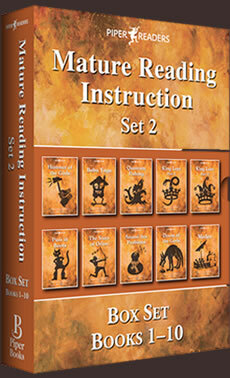 Set 1 contains90%-plus single-syllable words and two-syllable words, consisting mainly of root + suffix. Most words are repeated several times, resulting in enhanced comprehension and promotion of fluent reading. All MRI eBooks provide information on each new sound-letter correspondence as it is introduced, plus background information about each story. 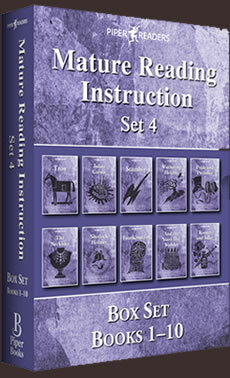 Mature Reading Instruction Set 2 introduces a further 23 Advanced Code correspondences, including the consonant digraph /ch/ ‘ch’ and ‘tch’, and correspondences that are easily confused, e.g. /er/ ‘ear’ (earl), /ar/ ‘ear’ (heart), ‘ear’ /air/ (bear). The suffixes ‘-le’, ‘-ly’ and the ending ‘y’ /ee/, enabling students to decode thousands of common words, are also introduced. There is an increase in multi-syllable words, with most words repeated several times to promote fluent reading. All MRI eBooks provide information on each new sound-letter correspondence as it is introduced, plus background information about each story. 10 books, c.2600 words per book. MRI Set 3 introduces a further 19 correspondences, including less common Advanced Code correspondences. Particular attention is paid to consonant digraphs ‘st’ /s/, ‘mb’ /m/, ‘wr’ /r/ and ‘ph’ /f/. 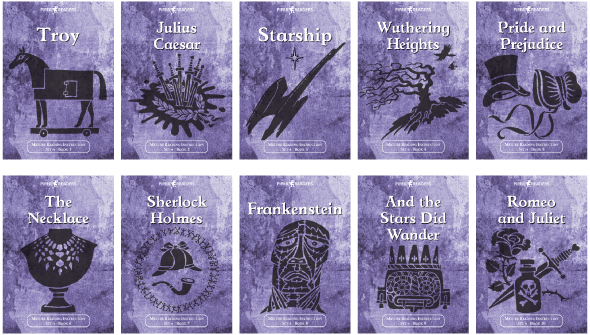 All new correspondences are repeated a number of times in parallel with increased use of multi-syllable words and growing sophistication of syntax and story interpretation. 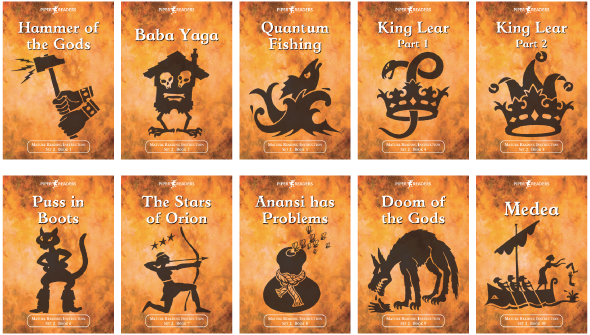 All MRI eBooks provide information on each new sound-letter correspondence as it is introduced, plus background information about each story. MRI Set 4 introduces a further 24 correspondences and presents less common ‘special endings’ e.g. ‘politician’, ‘special’. 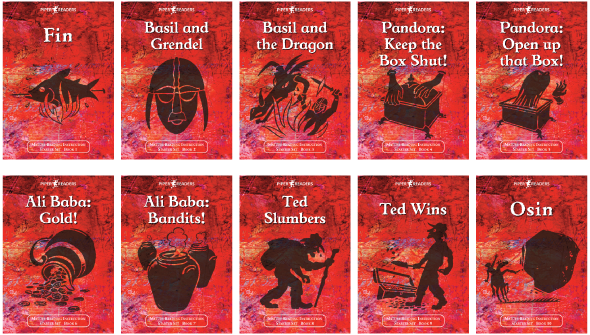 Within the safety net of secure decoding practice, students are expected, on completion of Set 4, to have the expertise for sustained reading of a wide range of fiction and non-fiction. All MRI eBooks provide information on each new sound-letter correspondence as it is introduced, plus background information about each story.